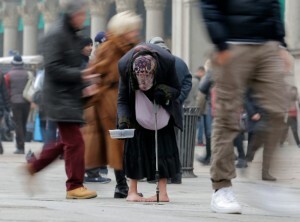 The European Commission has raised the alarm that eurozone countries are on the verge of facing a wave of poverty, as the economic crisis gripping the continent appears to deepen. The warning came a day after the European Commission’s office for Employment, Social Affairs and Inclusion released a report that indicated unemployment in some countries has reached record levels with nearly 19 million people jobless in the eurozone. Earlier, the European Central Bank warned that the eurozone crisis was growing direr as the member states appeared to be slipping into a double-dip recession. But the story is far more grim writes Vistula University’s Krzysztof Rybinski in the Financial Times. “A critical sign is that public debt levels and unemployment rates are rising fast in the troubled southern European countries of Greece, Italy, Spain and Portugal. “For example Greek debt is expected to hit 200 per cent of GDP, and in Spain public debt is growing from below 40 per cent in 2007, to a likely 100 per cent of GDP in 2014,” he says.